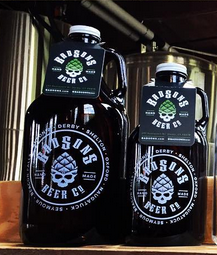 All our beers are available for 64oz and 32oz Growler and 32oz Crowler can fills on a regular basis. We’re happy to fill your own growlers but if they are screw top, please remember to bring the proper caps too. Idaho 7 hit this DIPA with fresh dankness. Open Up A Can of Whoop...BIG WHOOP is a BIG Double IPA featuring BIG additions of Mosaic and Amarillo hops to add a BIG punch of sweet stone fruit —all nicely balance against a spicy grapefruit character. Can I get a WHOOP WHOOP?!? With 3 pounds of Citra hops per barrel, MISCHIEF IPA stands alone with its juicy haze and notes of passion fruit flavors. A big Columbus hop back bone brings the noise with a citrus freshness and subtle bitter finish. Made for all day drinking, CONN ALE’s light malts offer a candy character that nicely compliments the finest Connecticut grown Cascade hops used in crafting our east coast style pale ale. This easy drinker has subtle strawberry, floral and mild spice hop flavors. An American Lager crafted with two German ‘noble’ hops to give a character that is crisp, light, and refreshing. Every barrel of our Double IPA is loaded with CTZ, Citra, and Centennial hops. We then double down with the lupulin powder of Ekuanot and Mosaic. The hops and powder blend together for a fruity smoothness and robust tartness that can only be described as LUPEFIED. Our first ever collab with our friends at Armada Brewing, this Double IPA is brewed with lactose and a bunch of childhood favorite candies. Double Dry Hopped with Mosaic Cryo, Amarillo and Hallertau Blanc.